An elephant and a bird in the wilderness of Ghana, 28 November 2006. Calling 2017 “the first year in human history” that more new clean energy was added to the grid than new oil, gas and coal combined, Erik Solheim, Executive Director of the UN Environment Programme (UNEP) has told UN News that “we are on track” but “we really need to speed up”. Southern India, for example, now has “the first all-solar airport in the world”, he said, pointing out that some of India’s southern states are experiencing “the most rapid economic development anywhere in the world — based on solar energy”. Moreover, he said that in the United States, “there are five times more jobs in solar, than in coal”. Speaking about Sustainable Development Goal (SDG) 15 — protecting life on land — the UNEP chief was also upbeat, saying that China had recently prohibited all trading in ivory; “very important because it stops the market for those killing elephants in Africa”. And calling it a “huge, huge achievement”, Mr. Solheim said that Indonesia has reduced deforestation across its peatlands by close to 90 per cent. Peat is partially decayed, dead vegetation, which stores enormous amounts of carbon and, among other things, soaks up water — helping to mitigate flooding — during wet season and releases water during dry season. Mr. Solheim explained that UN Environment works with government, civil society and businesses, to turn protecting nature into a business opportunity, which benefits all. Zeroing in on SDG 14, life below the water, the UN Environment chief shared a moving story of a dying whale in Thailand that had swallowed 80 plastic bags. Adding a silver lining, Mr. Solheim observed that people and governments are now taking action in response to such stark examples of environmental destruction. India, he noted, has promised to phase out all one-use plastic bags by 2022; while the European Union has announced a new strategy to use plastics in a more environmentally safe and sustainable way. Chile’s parliament has also taken “strong action against plastic”, he said, adding that Kenya, Eritrea and Rwanda had all promised to take more action. Mr. Solheim said that linking sustainable tourism with economic opportunities, jobs, development and sustainable energy was “the way forward”. “The only way we can really protect the planet is at the same time, provide opportunities to people who are living on this planet,” he added. He concluded his interview with UN News by emphasizing the goal of making the 2020 Beijing Conference for nature as effective and consequential as the 2015 Paris Agreement on climate change, where substantial steps will be taken to protect all of the Earth’s wildlife, ranging from insects to the most high-profile vulnerable and endangered species such as “the tigers, the pandas, the polar bears, the lions”. 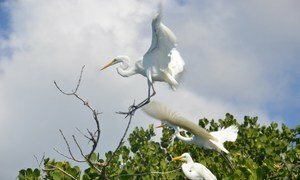 Protecting mangroves, tropical rainforests and other biodiversity hotspots, the United Nations Educational, Scientific and Cultural Organization (UNESCO) bumped up its World Network of Biosphere Reserves by 24 new sites on Wednesday, which means that 686 unique natural sites in total are being preserved globally.